The Rocking Pony: It Was an Off Day. Again. It Was an Off Day. Again. Micah has been all Dr. Jekyll and Mr. Hyde at school recently. One day he'll just be as bad as bad can be, and the next a model student, surpassing even the highest expectations of him. There is no pattern or triggers to his on and off days that we have been able to establish. It's just what he feels like doing at the moment, and it's frustrating to all concerned. Today was an off day for him. A really off day. The school and I have coordinated a plan where he gets his iPad taken away for the evening if he's bad at school that day. It has mixed results, based on how Micah feels like acting the next day, but he does understand that it's a punishment for his bad behavior earlier, so we continue on, hoping to find a motivation for the boy to just be good all the time. Or most of the time. Even a lot of the time would make us happy. 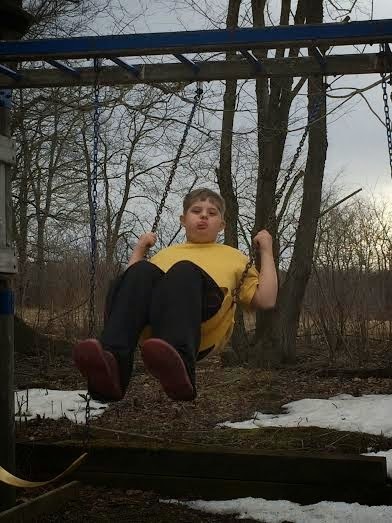 That's a very happy boy, swinging his heart out in the great outdoors on a super sunny and warm Monday afternoon. (Also note, the snow is receding quickly. I'm loving it.) The happy boy is indeed sticking his tongue out at his mama. Swinging is one of Micah's happy places. And after he finally came in from spending time in the great outdoors, Micah read books, looked at photo albums and only put a movie on TV just before bedtime. I think I like no-iPad days. It seemed to reset Micah's happy-meter for a bit. He did fuss about having to unload the dishwasher, but I think that's standard when you ask any kid to do any chore, right? Dare I start the "summer needs to come" chant? Is it too early for that?